Maurizio Sarri has hailed the quality his Chelsea side have in their attacking ranks, claiming anyone in his position can consider themselves a ‘lucky man’. The Blues claimed their fourth consecutive victory on Saturday with a 2-0 win at home to Bournemouth , leaving them joint-top of the Premier League table with Liverpool and Watford after the first four fixtures. 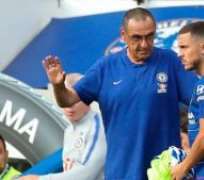 Sarri opted to start Eden Hazard and Willian either side of Alvaro Morata in the centre-forward role , the club’s top scorer Pedro finding himself left on the bench at Stamford Bridge. It was the Spaniard who ultimately claimed the points for his side, however, opening the scoring after replacing Willian late in the game. Hazard doubled Chelsea’s lead with five minutes of the 90 remaining, securing a fourth win from four under the guidance of Sarri. And while the Italian coach was quick to praise Pedro’s impact, he also highlighted the strength in depth he has available to him in the attacking ranks at the club. “Pedro played the first three games in the starting XI but today I thought it was better to play with Willian,” Sarri told reporters at Stamford Bridge. “I am lucky because any coach who can choose between Pedro and Willian is a lucky coach. Despite Sarri’s words of encouragement, the Chelsea boss has stopped short in suggesting his side can compete with the likes of Manchester City for the title. Sarri has been implementing a new style of play in west London and feels that in order to mount a genuine charge to be champions, his team must learn how to defend properly. Chelsea’s performance against Arsenal a fortnight ago was a cause for concern for Sarri, but he once again pointed at a number of situations in which his players could have done better against Bournemouth. “I think we need to be careful – especially the positioning of the player when we are in the offensive phases,” Sarri said. “Today, we had the right full-back making a cross and the other one in the box. It was a little bit dangerous. We were always in a position to face the counter-attack with only the centre-backs. “David Luiz and Antonio Rudiger were in the right positions when the opposition attacked the space but the defenders and the midfielders on the left and right were not. We need to improve the positioning under the line of the ball. Sarri has had little time to explore his new surroundings since arriving in London, revealing that the only opportunity he had to take in the capital was after the club’s 3-2 victory over Arsenal. Living in Cobham and having joined one week into pre-season, the 59-year-old has been playing catch up on his rivals for the top spots in the Premier League. Sarri admits that with the international break that he will have more time to himself but he is concerned about the lack of contact with his star men. “I don't know [what we will do at Cobham] because it is very difficult to work, we have 18 or 19 players in national teams,” Sarri said. “We will be only eight or nine players, so it will be very difficult to work. “I think that is a problem because with this situation, the very important players at the end of the season could play 65 or 70 matches and I think that is not right.